You can use the Action menu or contextual menu to perform various actions. The Action menu appears on the bottom right corner of the Info Panel. It allows you to perform several actions for the selected contact, including sending an email or instant message, initiating an audio or video chat via FaceTime or Skype, creating a new linked event in BusyCal, or sending your vCard to the contact via Mail or Messages. Note: When sending an email, the primary email address will be used. Get Info — Opens a floating info panel for the selected contacts. Edit Contact — Switches to Edit mode. 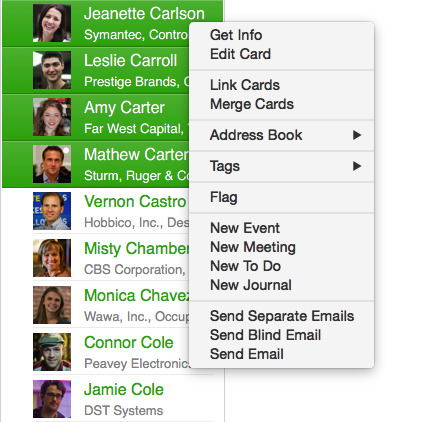 Link or Merge Contacts — Allows you to Link or Merge the seleted contacts. Address Book — Allows you to move the contact(s) to a different Address Book. Tags — Allows you apply Tags to the selected contacts. Flag — Allows you to Flag or unflag the selected contacts. 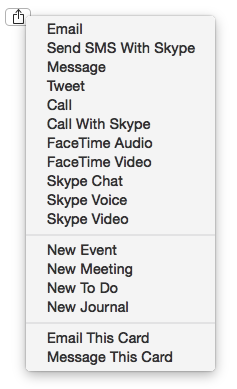 New Event/Meeting/To Do/Journal — Allows you to create a new event in BusyCal that is linked to the selected contact(s). Send Separate Emails — Creates a separate email addressed to each of the selected contacts. Send Blind Email — Creates a single email addressed to all of the selected contacts as blind carbon copies. Send Email — Creates a single email addressed to all of the selected contacts.